Standing on the shore you can hear the thunderous roar and see the white foam, the holes, the walls, and the waves, but you cannot imagine the raw power of the river. The excitement builds as you and your teammates climb aboard in calm water. 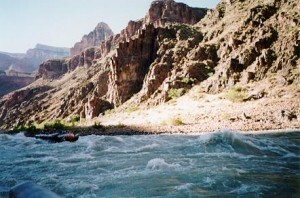 You can feel the anticipation of the river flowing under your boat. It wants you. Sliding out into the froth your senses are aware of the slightest sound, sight, or movement. You balance on the edge and it seems the slightest nudge will send you swimming. Nearing the first rapid your pulse quickens. 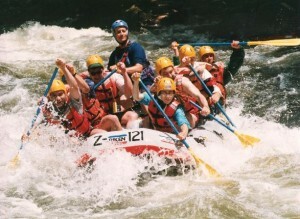 You hear your guide call that fateful command, “All hard forward!” The raft lunges into the maelstrom. The river tosses it left, right, and up. It plunges down. The force of your paddle against the water holds you inside the raft against twisting, pulling, and pushing forces of inertia. The waves splash over your head. Gasping for air between blasts of water you can hear your guide steadfastly calling his commands; finding the weaknesses of the river and using the river’s own strengths against itself. Suddenly everything is calm. You have made it through the first rapid. The adventure is not over yet. You have many rapids left to traverse, but safety comes first. 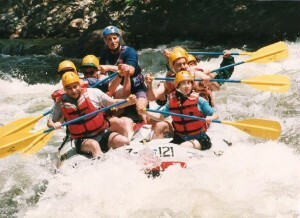 Maneuvering over to a large boulder you stop to assist the raft following you. You watch as it plunges into the walls of water, as it disappears into the holes, and as it skirts the rocks. 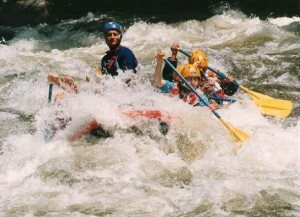 One of the rafters misses a stroke and plunges into the tempest. Seconds later two of his teammates pull him back in, but you notice your guide has already thrown a lifeline across the river, just in case. Finishing the trip will be a great adventure. Beware the wrath of the river–for she can easily pull you down–but fear her not. If you treat her with respect and admiration, she will in turn allow you to pass unscathed.